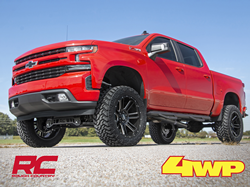 In a move to strengthen their retail portfolio and broaden product offerings, 4 Wheel Parts (4WP) has partnered with leading industry manufacturer Rough Country Suspension Systems. Off-road consumers can now purchase Rough Country Jeep® and truck lift kits online and through select stores. For years we have fielded consumer requests for Rough Country products, and now the industry’s largest manufacturer of suspension lift kits and the industry’s largest retailer/installer of suspension lift kits are partnering-up to create an unbeatable combination of value and service. 4 Wheel Parts (4WP), the global retail and installation leader in off-road parts and accessories, today announced a new partnership with leading manufacturer Rough Country Suspension Systems. Consumers can now purchase Rough Country Jeep and truck suspension lift kits online (http://www.4wp.com / http://www.4wd.com) and through select stores. “We are incredibly proud and excited to add Rough Country to 4WP’s roster of high quality, off-road brands,” said Tim Watts, Category Director of Suspension and Performance for 4WP. “Rough Country offers excellent bang for the buck and fills a niche that will go over well with our customers.